If we live in a post-media and post-cinema condition, how much longer will it last, and how will it end? 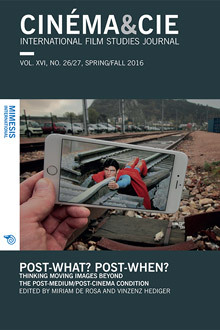 Picking up on the recent debate about post-media and post-cinema, this special issue of Cinéma & Cie addresses the question of temporality and periodization in media history and asks what exactly the ‘post’ in post-cinema means. The contributions approach this question from a variety of perspectives and discuss a number of key issues, from the question of medium ontology to that of medium specificity, from the development of digital and hybrid cinematic forms to the problems and pitfalls of preservation. Exploring new analytical and theoretical frameworks that account for the moving image in the multiplicity of its configurations, the contributions open up new avenues of research and provide a sense of what may lie beyond our current post-medium and post-cinema condition.